Fashion is all about proportion and nothing changes the proportion of an ensemble as quickly or efficiently as footwear. One can’t overestimate the importance of using just the right shoe or boot to emphasize a silhouette, and create a desired look and mood. 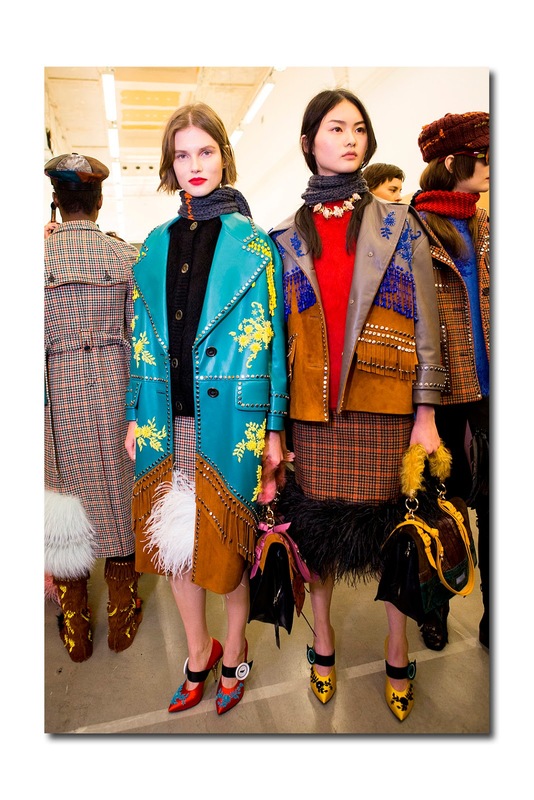 This was exemplified on the runways for Fall/Winter 2017 which was defined by diversity and variety not only in the clothing shown, but in the entire arena of footwear. Once again, anything and everything goes; each option is valid. 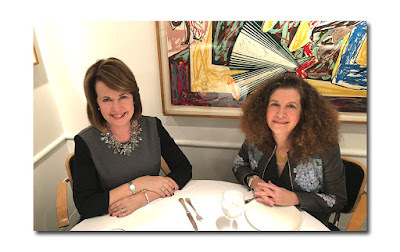 Needless to say, there’ was a world of difference in the overall look of an outfit when a flat shoe was used, as opposed to something on a low, mid, or high heel. The same can be said about the shape of the heel: is it a pancake flat, a flat form, a platform, a block heel, a kitten heel, a stiletto, or something conical and sculptural? Then of course there’s the shape of the toe. This past month, everything has been proposed by designers. There were almond toed Western style boots at Calvin Klein and Proenza Schouler. 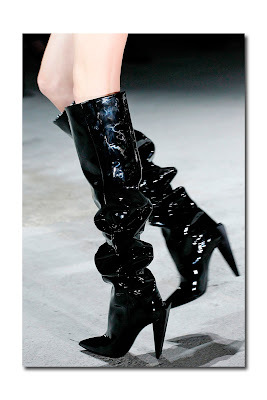 (This is undeniably the season of the cowboy boot regardless of its incarnation). 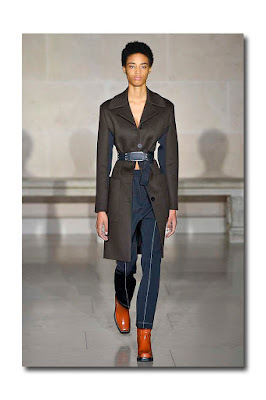 Square toed, sturdy, western style ankle boots were shown at Louis Vuitton, where they worked particularly well with Nicolas Guesquiere’s cropped trousers and well- tailored coats and jackets. 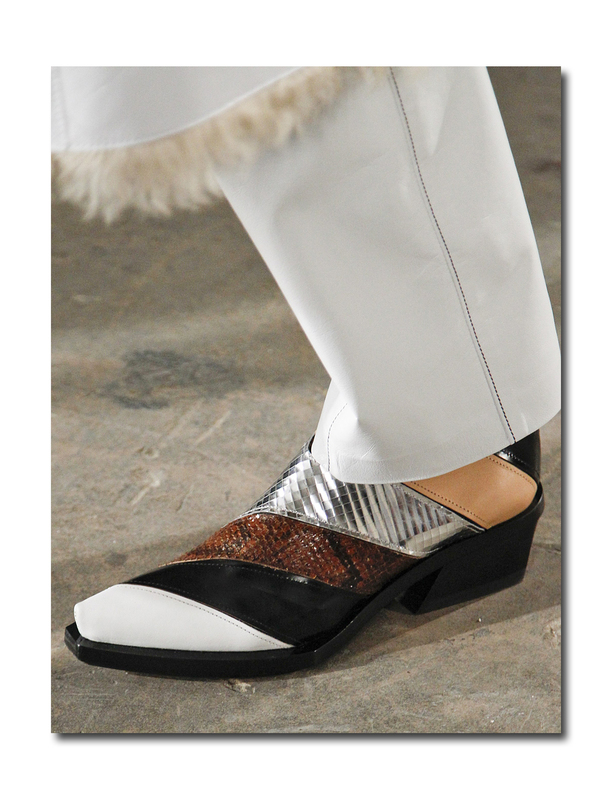 Toes were squared off at Stella McCartney, Miu Miu, and Chloe. 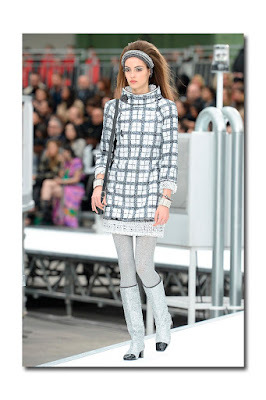 At Chanel, which had a hard to miss mod 60’s space age vibe, Karl showed only one boot (though in various iterations): a square toed cap toe go-go boot. I guess you can say it's "hip to be square". 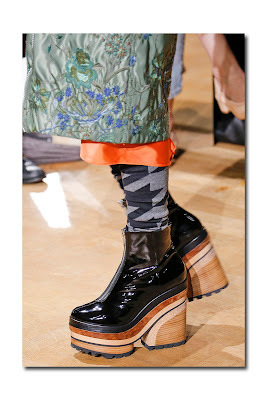 There were taper toed grounded, heavy platformed ankle boots at Sacai, adding to the pragmatic, streetwise, ready for anything mood of the collection. 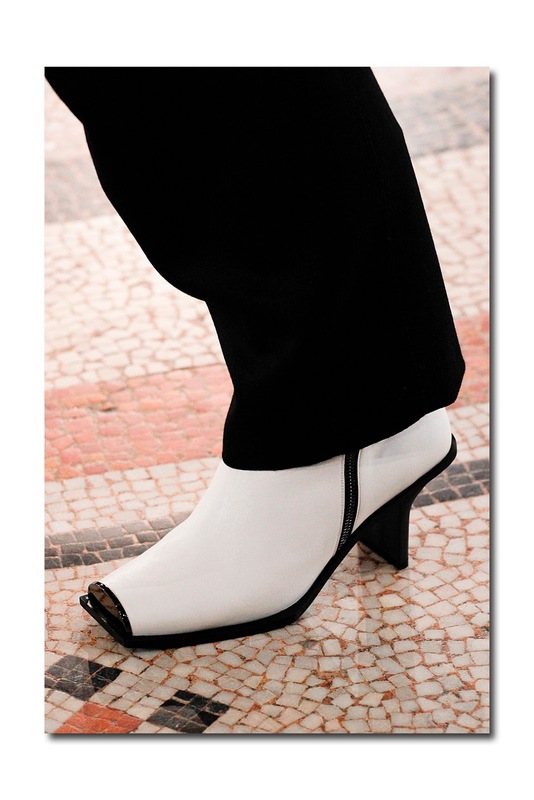 At Celine, where Phoebe Philo proposed a variety of options (including trainers) and showed different heel heights and shapes, there were round toes as well as pointed toes peeking out from beneath elongated, narrow trousers. 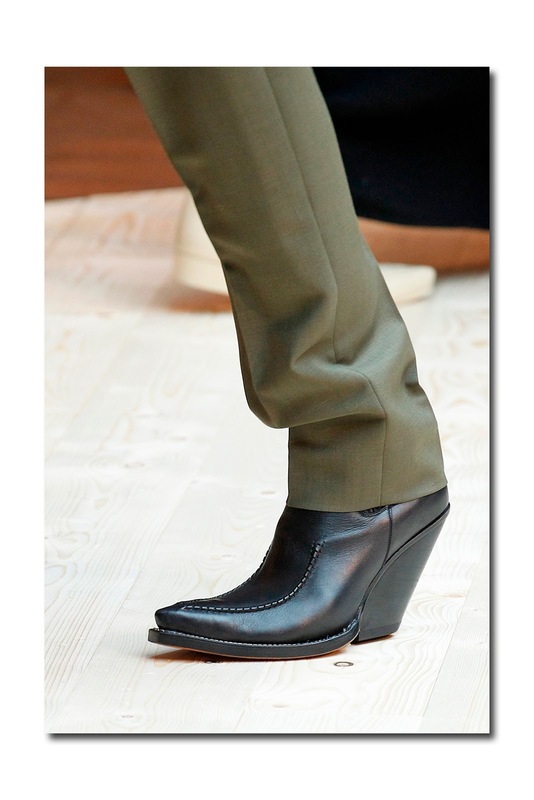 An ultra-chic pointed toe cowboy boot perfectly counterbalanced her decidedly menswear inspired collection. At Prada, which was all about a mix and clash eccentric glamour, in addition to wooly apres-ski boots and fluffy feathered sandals, there were teetering stiletto mules punctuated with gold hardware, and color-block pointed pumps with over-sized button closures and twisted metal heels. 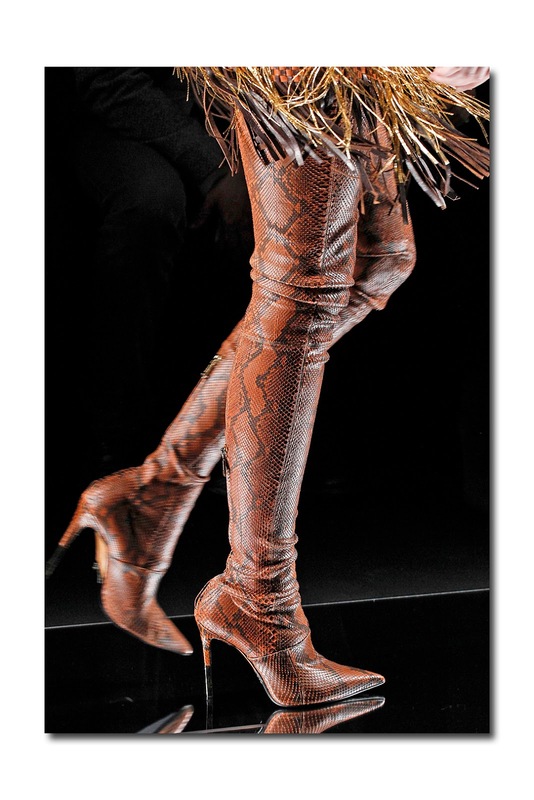 Balmain's second skin snakeskin over the knee boots, and others like it, were shown on Olivier Rousteing's "Balmain Amazon models" (the collection was all about the merging of "couture, rich, rock 'n' roll"). 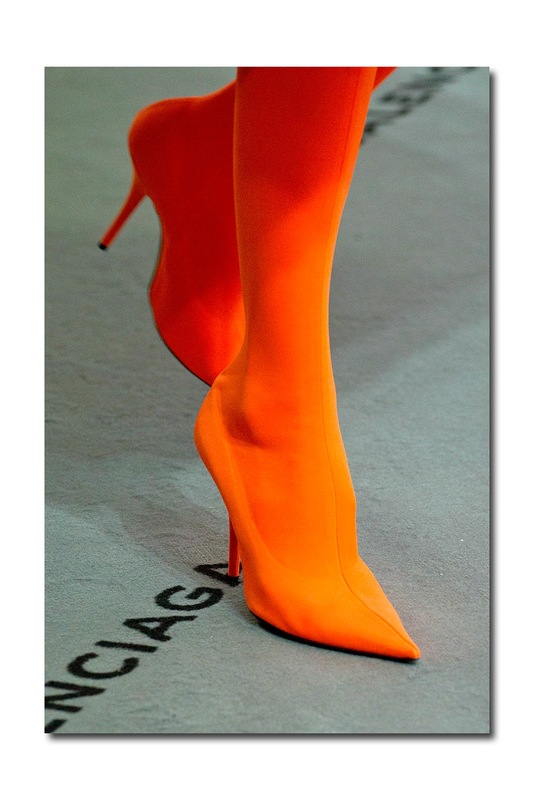 Balenciaga’s Demna Gvasalia was quite “on point” with his stiletto heeled, brightly hued spandex pointy toed stocking-boots; a continuation from spring. Some of his fabric covered pointy toed stilettos were emblazoned with the word "Balenciaga". He also introduced the “Knife” stilettos covered in florals and polka dots (talk about 'killer' shoes). At Saint Laurent, which was fierce, edgy, and rock n roll, Anthony Vaccarello’s scrunched gleaming leather and patent leather boots not only featured pointy toes, but pointy heels. In fact, almost everything seemed pointy (and dangerously so). 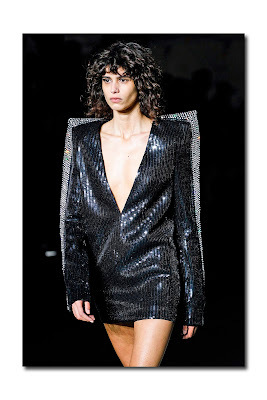 There were pointy shoulders on many of his jackets and dresses (if you wore one of them and got too close to someone at a party, it could conceivably poke their eye out). Some of his crystal earrings were even pointy. Ouch! 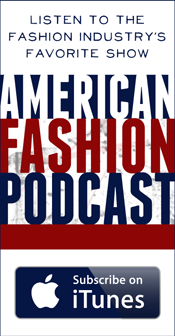 Much has been said about the strong confident woman being the designers’ muse this season, and much has been made about the dearth of clothing as combat wear; protective armor which can shield one from a hostile environment and often dangerous world. I could not help but think that some of the aforementioned pieces could easily do double duty as bona-fide weapons if you needed to defend yourself. 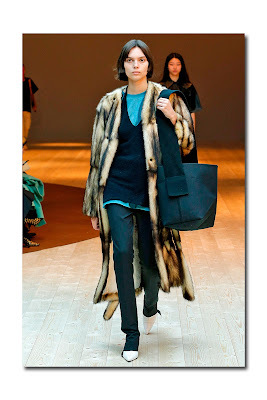 Labels: In the Market Report by Marilyn Kirschner: What's The Point?